Keystone Fieldhouse Summer Camps are here! Don’t wait to get registered! There are a limited number of spots and you’re not going to want to miss this!! 1) Go to our website keystonefieldhouse.com and under the “view schedule” drop-down create a login/password (if you don’t already have one). Once you are logged in you can choose the week you want and register and pay under the camps/classes….. If you want to do the discounted two-week option you will need to go under “packages” at the top of your login page….If you have ANY problems with the registration process PLEASE contact us. 2) Stop into the Fieldhouse with payment (cash, check or CC) anytime during regular hours. 3) Call Joel @ 717-798-0748 with CC payment ready…. Please leave a message if there is no answer. Players will need: Baseball clothing (baseball pants, hat, cleats), baseball equipment (glove, bat, helmet), a drink (we will have water there), and a snack/bag lunch for break (exception; the last day we will have a pizza party). Inclement weather: In the event of inclement weather we will move the camp indoors to the Keystone Fieldhouse Indoor Facility. You will receive an email at least 1.5 hours prior to the start of camp informing you of any changes. Our Fieldhouse Summer Camps will be made up of two separate components. First, an instruction component, which will involve focused small group drills and instruction covering various aspects of hitting, fielding, base-running, etc. The Second will be a “sandlot” component which will involve baseball centered learning games such as small group skills competitions, scrimmages, water balloon BP, pool ball (on the last day of each week), and other various FUN centered baseball activities. Camps will have a minimum of 4 qualified instructors on staff. Depending on turnout and the days plans, instructors will be a combination of Joel Culver, Billy White, Trent Culver, Justin Charles, George Michael, and various current college baseball players. A concern with some parents/coaches with summer camps are with pitchers. Particularly with current rec/travel seasons underway and an upcoming all-star season…..With that in mind we will be doing little to no “physical” pitching activities. Pitching instruction will be more discussion based, basic fielding of the pitcher’s position, prep and recovery, and the mental side of pitching. Instructors will pitch during ALL scrimmages and live play. If you have any questions or need help getting registered please don’t hesitate to contact us via email or phone call! Our hours have changed slightly…….. Please contact us directly via phone call or email for scheduling. Please keep in mind that scheduling is based on a first come first serve basis so don’t wait until the last minute when there’s rain in the forecast. Our training facility is for players and teams of all ages and skill-sets a like. Our 27,000 square foot, climate-controlled facility can comfortably cater to not only the individual player but teams as well in a clean, comfortable, positive, high energy atmosphere. Parent lounge with free Wi-Fi. Fitness Center and Weight Room. 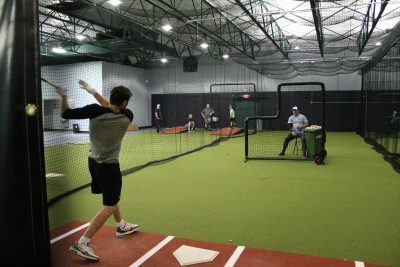 The fieldhouse offers many hitting or fielding variations for individuals or teams! Are you a pitcher that needs work or a team that needs to work on your pitching staff? Come throw in one of our 2 separate pitching tunnels or have your pitching staff utilize our pitching/arm care area with plyo wall, bands, weighted balls, and everything else they may need. Need to get stronger or faster? We can help with our full weight room with qualified trainers. We can set you up with a qualified instructor for some one on one instruction (hitting, pitching, catching, fielding) or we can set up a full team clinic and work with your players and coaching staff. Mon. – Fri. 4 p.m. to 8 p.m.
Saturday 10 a.m. to 8 p.m.
All Information © All Rights Reserved. | Hosted by Netrepid.com.